FRAMECAD is a pioneering New Zealand manufacturing company that has been taking on the world with innovative construction technology solutions for 30 years. Their product is a building system that takes Cold Formed Steel (CFS) and turns it into framing for robust, efficient buildings - a building system that is faster and more cost-effective than traditional building methods. Combining manufacturing innovation, with world-class design software and engineering excellence, the FRAMECAD System has revolutionised how governments, communities, and developers approach construction. The company delivers solutions around the globe and has a physical presence in 116 countries. Although a hugely successful company, FRAMECAD had relied solely on traditional sales methods to engage their diverse range of target customers - from third world governments, to multi-billion dollar private developers and everything in between. With long prospect-to-customer sales cycles that were open to competitor deal poaching, FRAMECAD realised they had to do more than rely on the skills of a highly distributed sales force to close deals. FRAMECAD and DBF had previously embarked on a digital lead conversion programme with a sophisticated website and CRM integration project in early 2014. But the team realised there was something missing. While we were influencing warm leads with rich digital website content, we were missing out on a huge piece of the pie. We weren't attracting enough new leads. How do we supplement the existing, highly customised CRM with an off the shelf marketing automation platform (HubSpot)? ecosystem. And this strategy, combined with the power of new HubSpot marketing automation technology, enabled FRAMECAD to take their marketing programme to the next level. The foundation of the strategy was identifying ideal personas. The team quickly realised that - regardless of geographic location, economic status or type of construction project - their target audience could be grouped into four key personas based on shared pain points, goals and triggers. This then meant a manageable calendar of content (that could otherwise have been unwieldy) was able to be created to meet the information needs of each persona, at each stage in their buyer's journey. Underpinning the strategy is a sophisticated email nurture programme that intelligently nurtures leads through to sales-ready qualification. Using 'smart rules' based on known data about each lead, the nurture programme offers leads new content relevant to the content they previously have or have not engaged with, to build trust, and gently encourage them closer to the point they are ready for sales follow up. And, to complete the loop, a custom Bedrock API integration was developed to sync HubSpot contacts and key data queries with the company’s Microsoft Dynamix CRM. For the first time, FRAMECAD was now able to attract and build trust with new leads through the entire sales process. Expected ROI for the results period at $69.33 /dollar invested. Note: the criteria for ‘marketing qualified’ was tighten during the results period so Sales only manage leads with the highest potential to convert. All other leads continue to be nurtured as part of the lead generation programme towards become 'marketing qualified'. FRAMECADs qualified lead to closed sales ratio is 1:4 and the average new customer life-time value (LTV) is $456,566. Forecast ROI is on track for a NZ$69.33 return for every dollar invested – 107% over target. 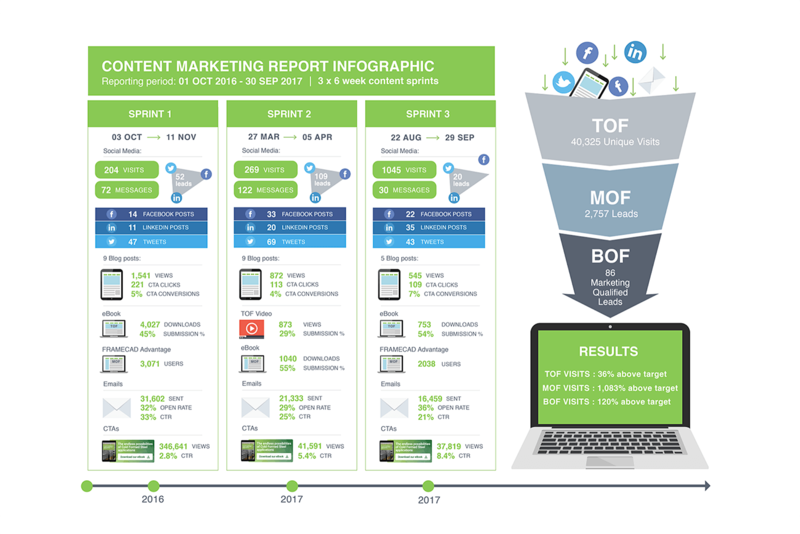 FRAMECAD had been successfully running a very traditional sales approach, so it was a huge shift to add personalised lead generation into the sales ecosystem - let alone then telling them we'd be doing this using content distributed mostly via earned media, particularly social media. This programme required a change in focus, reprioritisation of resources, buy-in from the sales and IT teams, and a journey of discovery when it came to the production of challenging premium content. The challenges were overcome and outstanding results achieved through the establishment of a clear vision, agreed objectives and a solid methodology for execution. This work also recently caught the attention of industry peers in the 2017 NZ Direct Marketing Awards, receiving a Bronze in the highly competitive B2B category, and a Bronze in the prestigious Nexus Awards for channel utlisation. The Nexus Awards recognise excellence in creating the foundations on which measurable campaigns are based: strategic vision, innovation, customer and market insight, response-driven marketing tools and techniques, plus products or services that make the use of interactive one-to-one communication quicker, easier, or more insightful. DBF is New Zealand’s leading inbound marketing agency and a Platinum Certified HubSpot partner.